Paint entire aluminum can with white paint. Paint a section in the front of the can peach (or whatever skin tone color you like) for the face. Take one cotton ball and stretch it out so that fits all the way around the rim of the can. Glue in place about 1 cm below the rim. This is Santa�s hair. Lay strip of white glitter felt on the table. With hot glue gun, fold over edges and tack in place on both sides. 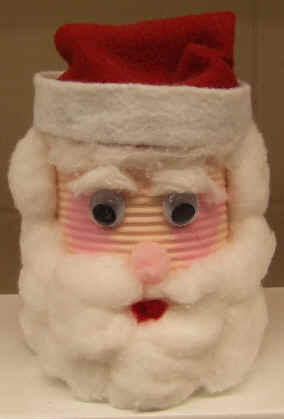 This will create a thick and smooth brim for Santa�s hat that will not show any uneven cutting lines. Set aside. Position the red glitter felt around the top of the can, above the hair (stretched cotton ball). Glue in place and let dry. 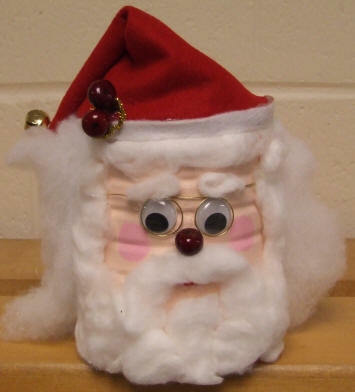 You will finish Santa�s red hat in a later step. Meanwhile, glue the white felt in place over the top of the red felt and the cotton to form the brim of Santa�s hat. 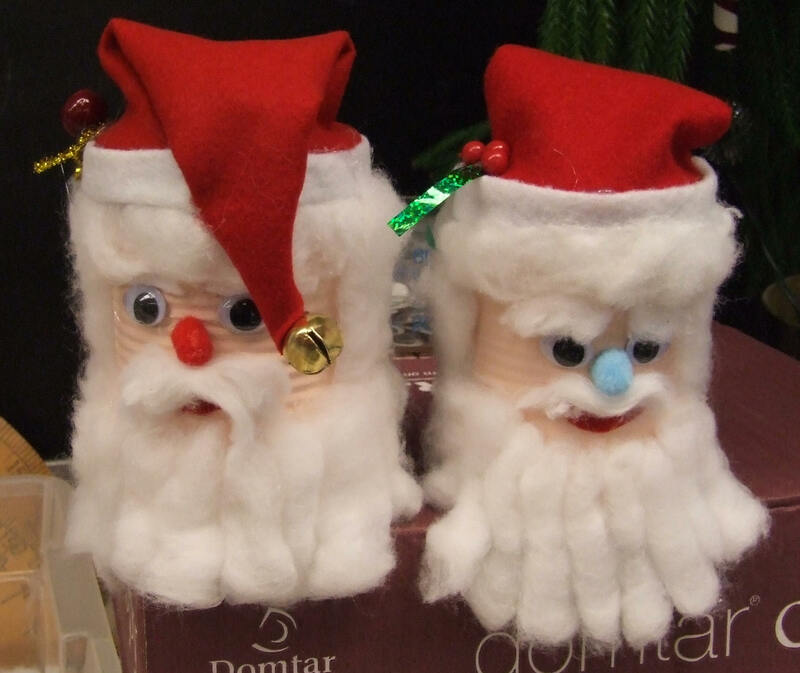 Using white craft glue, add Santa�s beard by gluing cotton balls all around the can, leaving enough room open for his face. 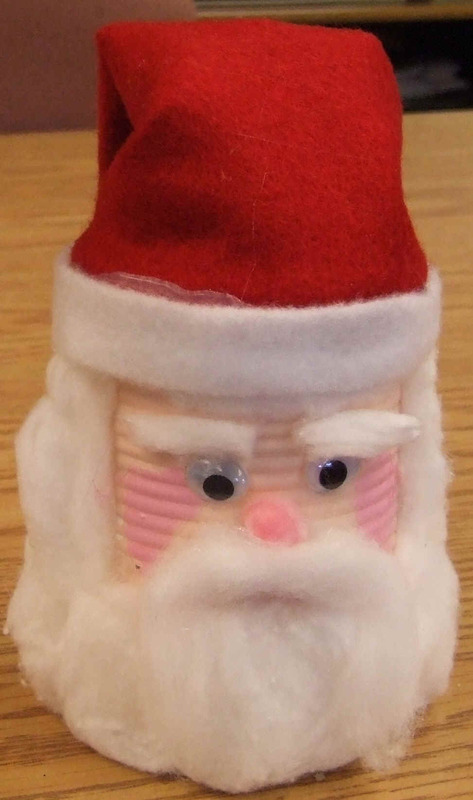 To complete Santa�s red hat, tuck the red felt into a cone shape, using hot glue to tack in place if you like. Fold felt over the side of the can and hot glue to the side. Hot glue the silver or white glitter pom poms to the end of the red felt. Use an extra cotton ball to dab on the cheeks, using a small amount of pink paint. Glue the pink pom pom on for the nose. Save empty tin cans and jars. Be sure to use a piece of sand paper to smooth out any sharp edges where the can was opened. For added stability, add a large rock or a baggie of sand to the can before gluing on the hat. This will make the decoration heavy and there is less chance of him toppling over on the dinner table.